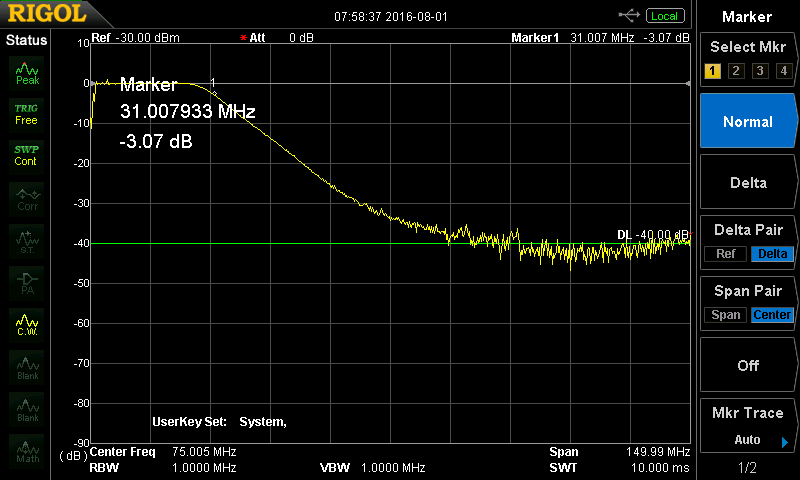 Different filters, providing more favourable working conditions in a particular operating range, are connected between the antenna (50 Om) and dongle RF input (75 Om). 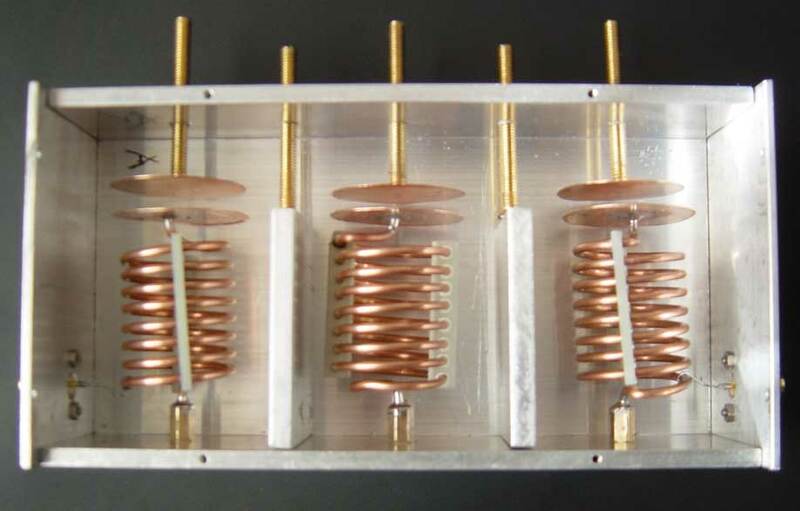 For example, it is necessary to use a LPF and Multi-Band Switched Filter Bank 1…30 MHz for operation in the HF range. The usage of the Band Filter 118…137 MHz can improve the reception in the aero range (listening to aircraft traffic control conversations). 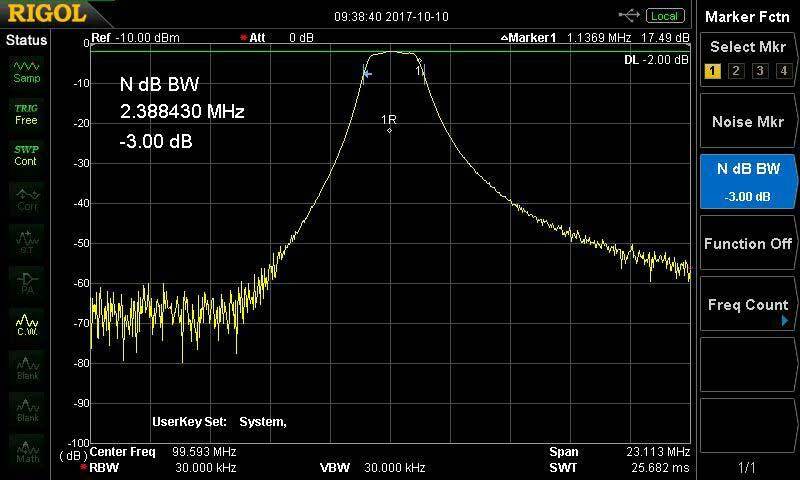 In the case of the DX, it is often useful to use a notch bandpass filter 87…108 MHz for suppression of powerful local FM stations. The presented list of filters can be expanded, depending on the reception conditions and the specific user requirements. 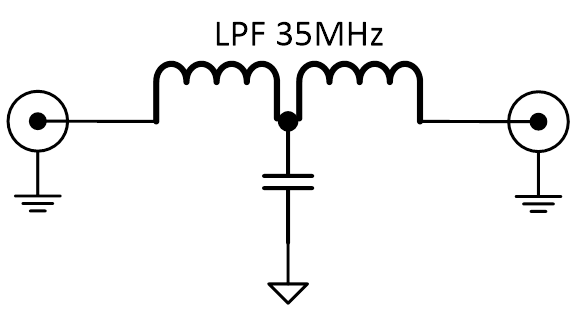 All developers of the convertors below 30 MHz are using multipolar LPF with a frequency cuto-ff at 30 MHz, e.g. HF Converter V3.2 from JaniLab, www.janielectronics.com. The discrete SMD elements (capacitors and inductors with a 1% accuracy) are used in order to build the qualitative LPFs, which leads to a higher price of the final device. 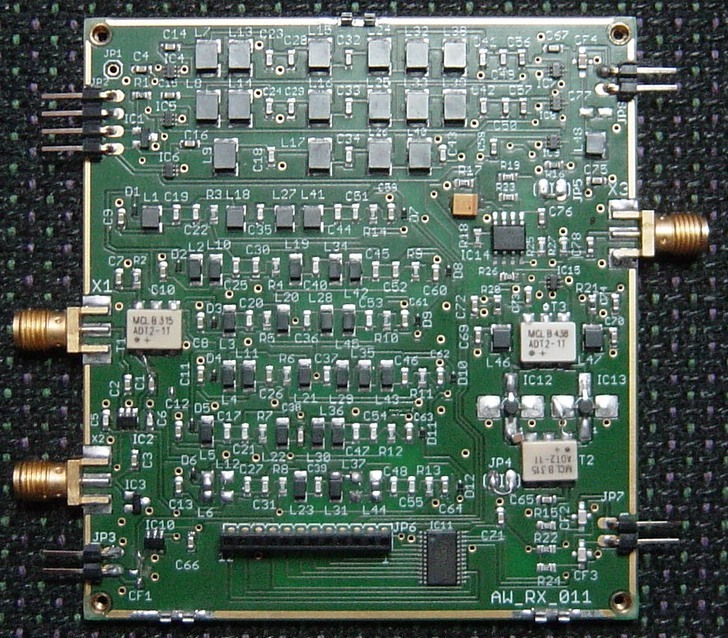 At the same time, the TDK company produces 3rd order LPF with a cut-off frequency of 35 MHz, which can be used to construct a LPF to convert the HF band signals in order to receive them on the RTL2832. The load of 50 Om should be ensured in the filter input and output. This makes it evident that it is possible to develop a filter using only 2 chips with the suppression over 60dB beginning from the frequencies of 60 MHz and above. The limited list of cut-off frequencies and reduced level of suppression in the VHF and UHF ranges are the disadvantages of the above mentioned filters. fh – upper frequency range. This explains the desire to limit the spectrum of the received signal by the useful components in order to achieve the best signal/noise ratio. 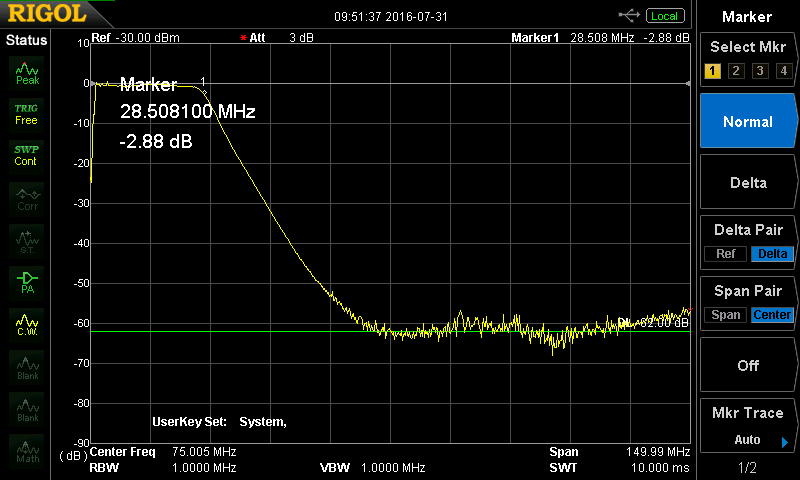 In practice, this is achieved by using a bandpass filter, which suppresses the undesired out of band interferences. There are many publications regarding the design of the bandpass filters, e.g. Eric T. Red. HF-Arbeitsbuch. Daten. HF-Grundschaltungen. 50-Ohm-Technik, ISBN 3-88976-137-2, 1993. Usually, such filters consist of LC and commutation components (Low-voltage high-frequency relays, electronic switches on the CMOS structures, PIN diode). The latest trend is the use of SMD components instead of non-mechanical relays in favour of electronic switches, PIN diodes and MEMS switches (expensive). The usage of electronic keys is justified to frequencies 2…3 MHz due to the presence of the interference capacities; PIN diodes are more favourable on the higher frequencies. Switches FSA3157 are used for the lower frequencies. PIN diodes BA891 (Diode capacitance CDmax = 1.05 pF) and low diode forward resistance rD = 0.42 Ω, IF = 3 mA. ) are used for the higher frequency ranges. 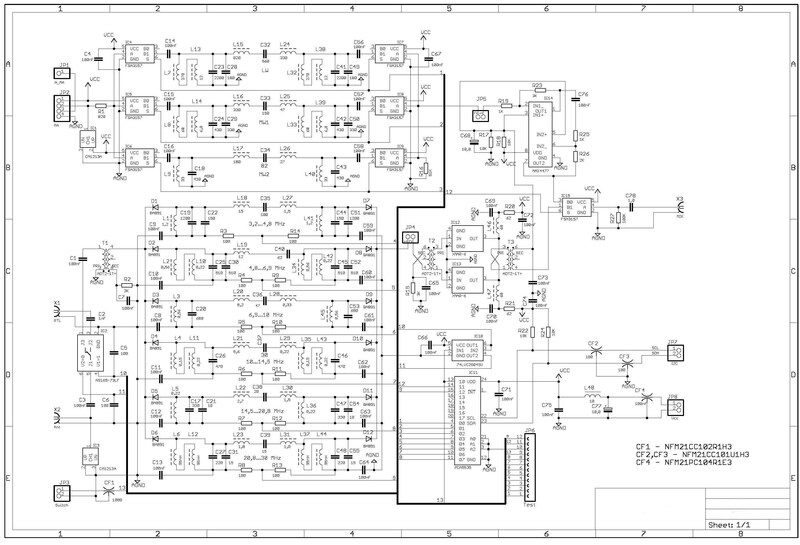 It enables the management of these diodes directly from the logical elements using Ucc =+5V.